Nakhal Fort was probably my favorite castle/fort in Oman. Not only is it super photogenic from a distance, but going up to the rooftop also gives you some incredible views of the surrounding area. You can see the rocky Al Hajar mountains stretching out in the distance. This fort was originally built in pre-Islamic times (as early as the 9th century), but a lot of the current fortifications were added onto it in the 17th century. The walls are pretty impressive, and the top of the fort is lined with cannons and other defenses. Before you tour the inside of the fort, I think it’s worthwhile to walk in a loop around the outside to get a better look at the walls. These are really cool, and they kind of make you feel like you’re back in medieval times. When you go inside the fort, it’s a bit like a mini-museum, because a lot of the rooms have period decorations and Omani weapons from back when the fort was used. Nakhal is one of the few forts in Oman that has an audio guide, and even though I didn’t use this I’ve heard it’s super informative and done in clear English. It’s also completely free! 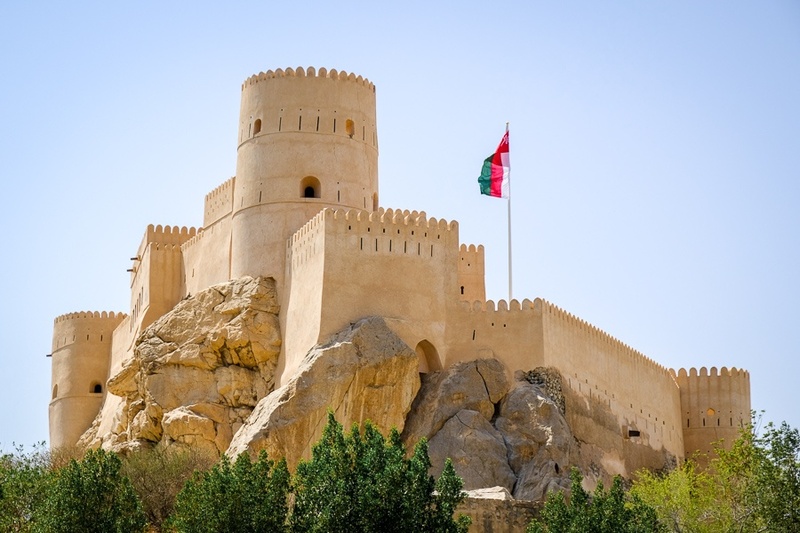 There are designated places in the fort where you can use it to get some extra insight into 17th century Omani life and how the fort was used over the years. Nakhal Fort is located near Rustaq, so it’s pretty easy to visit if you’re planning to go see Rustaq Fort or Al Hazm Castle! I’d say it’s very worthwhile! The fort is near Barka, about 55 miles (90 km) from Muscat.